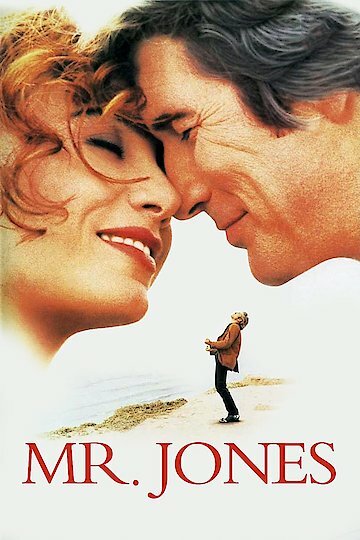 "Everything That Makes Him Dangerous Makes Her Love Him More"
In this moving film, directed by Michael Figgis (Leaving Las Vegas, Cold Creek Manor) we find Mr. Jones (played by Richard Gere) struggling with bouts of euphoric happiness and delusional highs and bottom out lows. On one of his good days, he convinces a construction foreman to hire him making unbelievable claims that he can produce the work of two men, and offers to work for no pay the first day to prove it. Things seem to be moving along fine, until Mr. Jones becomes distracted by a plane flying overhead and ends up walking out on a beam, seemingly thinking he can fly. Co-worker/friend, Howard (Delroy Lindo) coaxes him off the ledge, but his disturbing behavior leading up to the incident prompts a call to 911 where an ambulance arrives and carts Mr. Jones off for a psychiatric assessment. It is here that he meets Dr. Elizabeth “Libbie” Bowen (Lena Olin), the psychiatrist assigned to his case. During their intake session, Mr. Jones is in full on Prince Charming mode and thus receives an inaccurate diagnosis, and medication, and is released the same day. Within hours of leaving the hospital, he goes to the bank withdraws all his money, coaxes a bank teller to join him for the day where he buys her clothes, takes her to an opera, an expensive hotel and leaves extravagant tips behind. After spending all of his money inside a couple days, he attends a symphony where he is overtaken with a compulsion to jump on stage and attempt to take control from the conductor. This ultimately leads to him being arrested for a civil disruption which lands him back in the hospital, and back in the care of Dr. Bowen. During their therapy sessions, they begin to form a bond which ultimately leads to an unethical romantic entanglement. The film follows their journey, which becomes at times quite dangerous path for the both of them. Mr. Jones is currently available to watch and stream, download, buy on demand at Amazon Prime, Amazon, Vudu, Google Play, iTunes, YouTube VOD online.